Download a complimentary copy of this Windows-10 based Boot and Recovery Disk. This bootable image provides a GUI-based emergency recovery environment compatible with most 32 and 64-bit equipment. 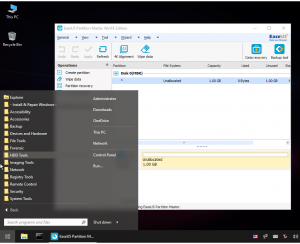 It support disks using MBR and/or uEFI/GPT formats and can be used (by a trained technician) with the Dr.Backup Local Image Backup Service to perform a “bare metal restore” operation. Using commonly available software, download and then “burn” the ISO image to optical media (DVD) or to a FAT32-formatted USB memory stick (4GB+). Use the resulting BARD to cold-boot your device from the media (ie., press F12 or equivalent at POST). The Dr.Backup Local Image Backup Service creates standard VHD (or VHDX) copies of entire disk partitions on customer provided backup media. The data in these file(s) can be used to “re-image” the original contents of a customer’s PC should the client experience hardware failure or ransomware corruption. This is accomplished using the partition manager (EaseUS) tool on the BARD to clone the VHD-formatted disk partition file(s) back to the PC. Please contact Dr.Backup technical support at (301) 560-4534 should you experience a computer failure or ransomware attack. We will work with your local onsite consultant to determine the best steps to restore your working environment. Credit: BARD .ISO developed by: TheOven.org.